Utah’s nonconference scheduling upgrade won’t kick in until next week at Minnesota. (Chris Detrick | The Salt Lake Tribune) Utah Utes forward Donnie Tillman (3) shoots past Missouri Tigers guard Terrence Phillips (1) during the game at the Jon M. Huntsman Center Thursday, November 16, 2017. Utah’s nonconference basketball schedule is upgraded in 2018-19, although that may not become apparent to Huntsman Center ticket-buyers until the end of the calendar year. The Utes will open the season Thursday night against Maine, one of four visiting opponents ranked lower than No. 300 by kenpom.com among the 353 teams in Division I. Beginning next Monday at Minnesota, Utah’s degree of difficulty will increase on the road and in a neutral-site tournament, so coach Larry Krystkowiak has been conscious of accelerating his team’s preparation for what’s to come. Krystkowiak gave his team mixed reviews last week after a 96-76 exhibition win over College of Idaho. Maine, coming off a 6-26 season and ranked No. 333, shouldn’t reveal many flaws in Utah’s defense. The Black Bears lost 62-50 at Denver in their opener Tuesday. They’re an interesting story, though, with coach Richard Barron having moved over from the Maine women’s program and hiring a female assistant coach, former WNBA player Edniesha Curry. Krystkowiak described preseason practice as “pretty rewarding” during “a rigorous time of year,” as his staff has done a lot of teaching with so many newcomers. Freshman forward Timmy Allen and graduate transfer Novak Topaolvic are expected starters, along with Tillman and seniors Sedrick Barefield and Parker Van Dyke. Forward-center Jayce Johnson is practicing on a limited basis, five weeks after breaking a bone in his foot. Mississippi Valley State – No. 349. Seton Hall* – No. 45. Florida A&M – No. 350. Northern Arizona – No. 318. * Potential opponent in Wooden Legacy. As for the home schedule, Tulsa (No. 116) is the biggest draw, prior to No. 5 Nevada’s visit Dec. 29. Kentucky, kenpom.com’s No. 9 team, is the marquee road opponent next month. The Utes' other top-60 opponents are No. 50 Minnesota and No. 58 BYU (at Vivint Smart Home Arena). The three-game Wooden Legacy in California during Thanksgiving weekend is Utah’s scheduling variable. If the Utes end up playing No. 45 Seton Hall and No. 20 Miami after beating No. 220 Hawaii, their schedule certainly will have lived up to the upgraded description. Records: Maine (0-1), Utah 0-0. About the Black Bears: Maine is making a three-game swing to begin the season, playing Saturday at San Francisco. … Five players scored between seven and 10 points in Tuesday’s 62-50 loss at Denver, as the Black Bears shot 31 percent from the field. … The game was tied 27-27 at halftime. About the Utes: Coach Larry Krystkowiak is 7-0 in season openers. … Utah is 3-1 against America East Conference teams; 3-0 vs. Stony Brook and 0-1 vs. Albany, as the Great Danes beat Utah 59-58 in 2006. 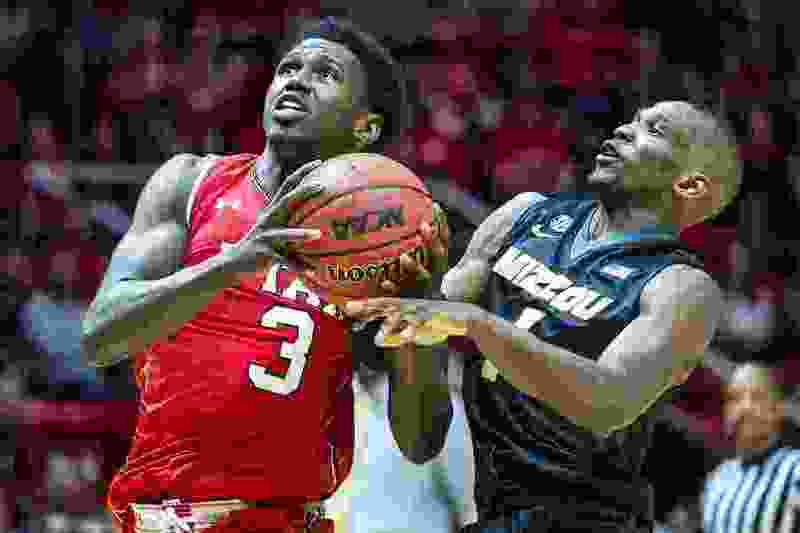 … The Utes will visit Minnesota on Monday; the Golden Gophers opened the season Tuesday with a 104-76 win over Omaha.